These are very noticeable to the general public and are a feature that costs very little. 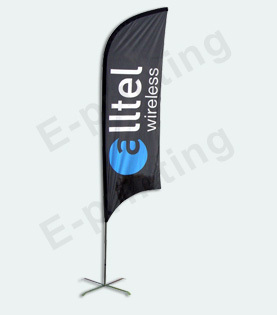 Tear Drop or Bow Banner swaying in the breeze will catch everyones attention, for either indoor or outdoor usages. These are so versatile they can be used on car forecourts, supermarkets, trade show events, hotels, the list is endless. Very little price for such a BIG IMPACT to your audience! At E Printing we offer size ranges form 2.5m-5.5m, reverse image or double sided print options. You can even choose your own base from the selection listed below.